GT Radial 205/65/15C dated 5011, fitted spring 2012 to the SA. Alarming molding fault clean across the tread of at least one, cracking in the bottom of all the treads and some sidewall perishing near the bead/rim. I won't be buying these again, despite the low wear rate and good grip. They were too hard from the off, I will try and find some 97 or XL rated from a better manufacturer this year. What sort of miles do you do a year? 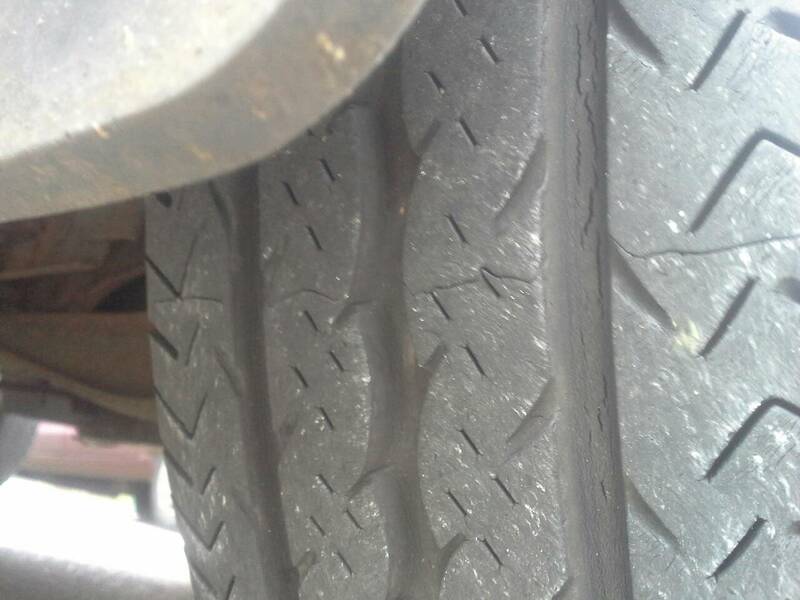 I was told rubber like to be flexed, the more you use your tyres the less they crack. Daily driver up until last week, admittedly it did stand for a while early last year but only for a few months. It would seem that either these are yet another poor example of Chinese/Indonesian goods, or a reflection that tyre rubber in general isn't what it used to be, possibly due to restrictions on sulphur used in the vulcanisation process. A bit of googling shows that GT Radial are known for perishing... Continental for me this time. Not a mould fault merely a tread splice. Those tyres being five years old are at the end of their life anyway. After five years I change mine, the sidewall rubber contains a percentage of natural rubber as it is more flexible with better heat transfer properties than synthetic, but being organic it will degrade quicker, after five years the resins in the compound will have all but dried out making the wall brittle. I was in the development and construction for Goodyear tyre and rubber for 20 years. Ich fahre einen Bulli. Ich hilfe mir selbst...meistens! It was so long lasting and hard wearing it was clearly a great product, unfortunately Goodyear realised this tyre would seriously compromise any profit made from car tyres. It was soon dropped and replaced with a grippier tyre, because the tread compound contained a bigger percentage of natural rubber. 35,000 miles is the norm nowadays, but after five years, the cracks will start. F1 tyres are made almost entirely of tree sap. They are made to last for a 4 to 6 months, if stored right. Qualifying tyres actually fully vulcanise on the car. Is my assumption that rubber products (steady now) like tyres and hoses are made by processes/compounds that are lower-sulphur content and this affects the vulcanisation and so durability/weather resistance. I have to be honest I have not heard of the sulphur content affecting tyre life. European tyre manufacturers have to conform to ISO standards, in order to fit their tyres as OE to cars, I used to know the recipe for many compounds, imported tyres from the Aisian continent have no such restraints, that's why they're cheap and you don't see those brands fitted to F1 cars. Tyre life is reduced by many factors but UV and heat are the most common, I would say by far the the biggest contributors to tyre life is certain resins that increase the strength/elasticity in high stress areas such as the apex in the bead and the shoulder area of the side wall/tread respectively. These specialised compounds deal with heat from flexing and maintain the tyre shape to ensure it does the job it was designed for a finite time, the resin degrades, the cracks are a pre cursor to that time ending, if allowed to go on it could end spectacularly.